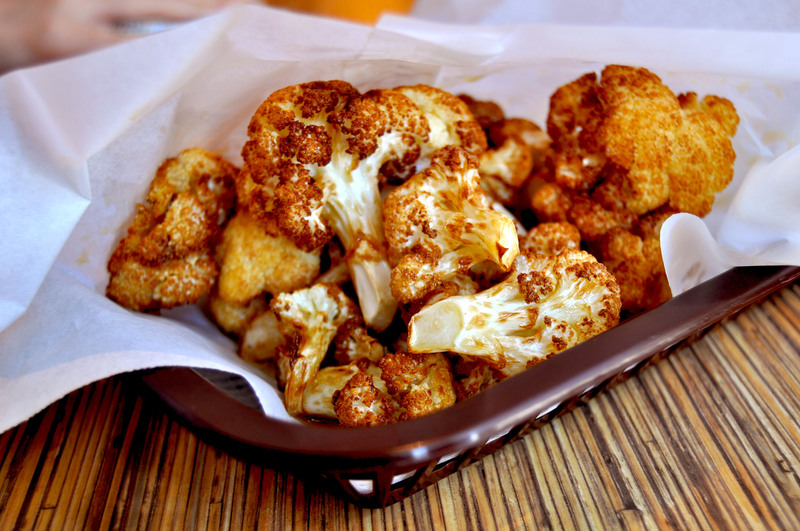 I love Mediterranean food because it includes a great variety of vegan dishes. My favorite Mediterranean place is Beirut Cafe, down the street from UT Arlington. It is a great place for vegans, because all of the vegetarian dishes on the menu are vegan-friendly (except for those that obviously contain dairy, such as cheese pies or the yogurt dipping sauce). When I go with friends, we often like to share the vegetarian mezzeh, which has an amazing number of dishes to choose from. 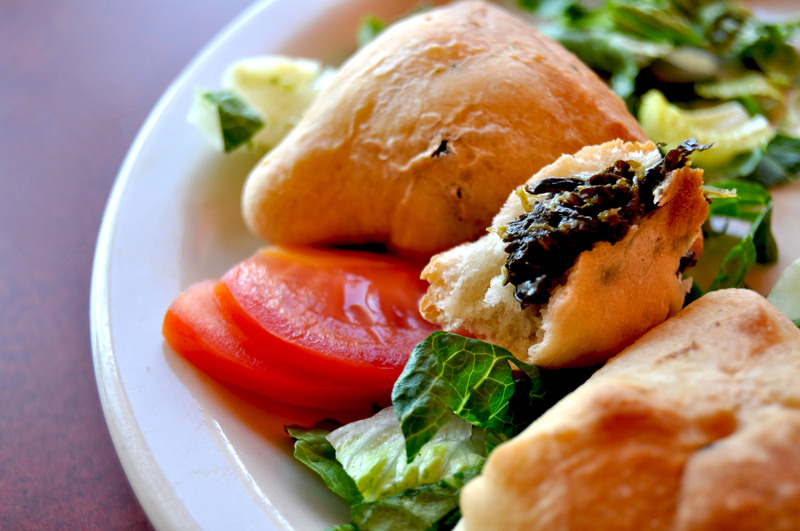 I am obsessed with the spinach pies (as pictured below). As a Beirut Cafe regular, I have been very curious to see how College Park’s new GRIP location compares to my favorite hummus and falafel joint. About a week ago, I finally got the chance to go check out GRIP’s vegan options. Update (10/8/13): GRIP’s vegan items are now clearly indicated with a “V”. For those sensitive to gluten, gluten-free items are clearly marked “GF”. I LOVE them for this–it makes things so much easier! Unfortunately, GRIP’s vegan offerings were not as abundant as I would have guessed, but they had a decent amount. The first thing I found out was that both their hummus and baba ganoush contain dairy. I was both saddened and surprised. From my personal experience, these dishes are usually vegan by default, because their creaminess comes from the use of tahini. I really appreciated the staff informing me, because I never would have guessed it. I’ll just stick to getting my hummus and baba ganoush fix at Beirut Cafe. The falafel wrap is the only vegan entree, but it’s pretty excellent! For those of you who have not tried it, falafel is a deep-fried patty made with chickpeas and/or fava beans. 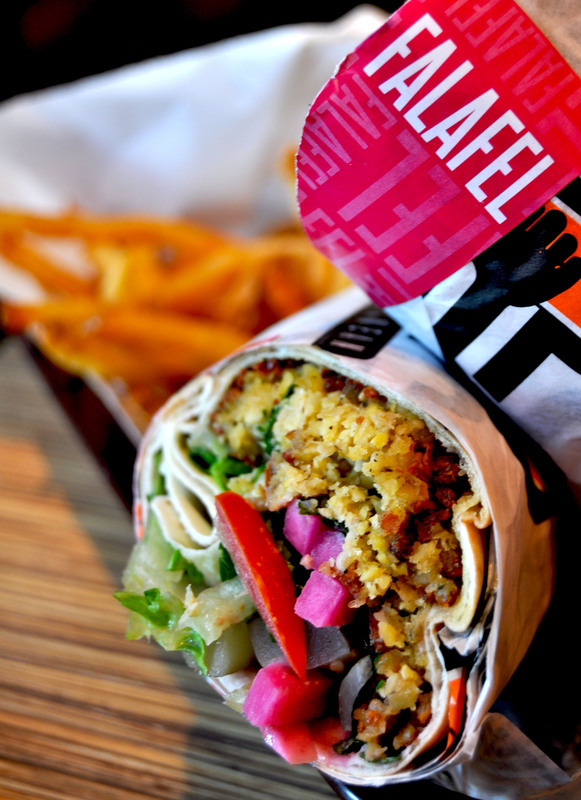 Beirut’s falafel wrap is similar, as both places use tabouli and tahini, but GRIP’s wrap is different, with its inclusion of mint and pickled turnips. In trying their wrap, I especially enjoyed the addition of fresh mint leaves. GRIP’s falafel is crunchy on the outside, with a soft, savory interior. Beirut’s falafel is well-flavored, but sometimes it’s a little too crunchy for me. Besides falafel, GRIP’s menu also has fries, fried cauliflower (comes with tahini for dipping), pita chips, tabouli and dolmas. Tabouli is a colorful salad made with parsley, tomatoes, bulgar, lemon juice, olive oil and garlic. Dolmas are stuffed grapeleaves that usually contain rice, but they sometimes have ground beef. The dolmas at GRIP are vegan-friendly, but I found that I much prefer Beirut’s veggie dolmas, because I think their rice is better seasoned. GRIP also has a Mediterranean salad that is very filling. It’s pretty obvious that Beirut Cafe will always have my heart, as long as they keep up with their vegan variety and continue to carry my favorite spinach pies and fattoush. However, I will still visit GRIP once in a while for their falafel wraps! If you get the chance to go to GRIP, try the falafel wrap and bring a friend! Their wrap is pretty big, so I split it with my sister. Please let me know your thoughts about GRIP in the comments! Update, 12/10/13: GRIP’s Arlington location is now closed! Students will have to get their Mediterranean fixes at Beirut Cafe, Prince Lebanese Grill, or Narah Cafe. Love love LOVED the falafel wraps at GRIP! And if I had a sister, she would have to order her own, because I ate the whole thing all by myself. 🙂 Love the mint, and I thought the pickled turnips were GENIUS. Genius!!! Glad you warned me about the hummus, because I’m not sure I would have looked at the ingredients. There should be a law against putting dairy in hummus. That just ain’t right. But the falafel wrap gets an A+ from me. Yes, it is so good!! !